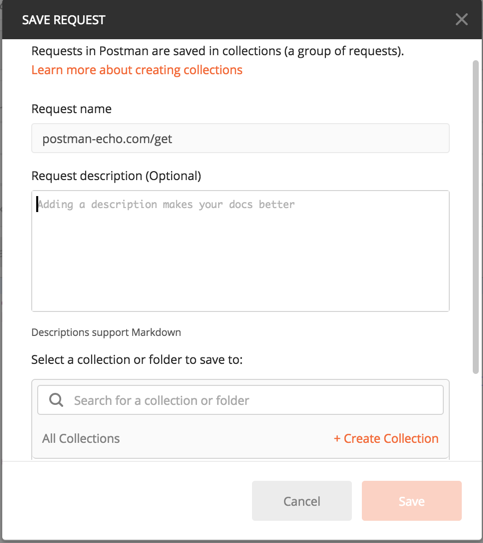 Postman Collections are a group of saved requests you can organize into folders. Every request you send in Postman appears under the History tab of the sidebar. On a small scale, reusing requests through the history section is convenient. However, as your Postman usage scales, it can be time consuming to find a particular request in your history. Instead of combing through your history section, you can save all your requests as a group for easier access. 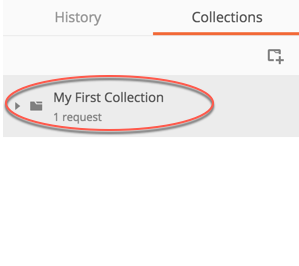 Let's review how to send a basic request and create a new collection. Enter a request in the request builder and click the Save button to open the SAVE REQUEST modal. As an optional step, enter a new request name. Otherwise, the default name will be the request URL. As an optional step, enter a request description in plain text or using Markdown. Save this request to an existing collection, or create a new collection by entering a collection name, and then click the Save button.